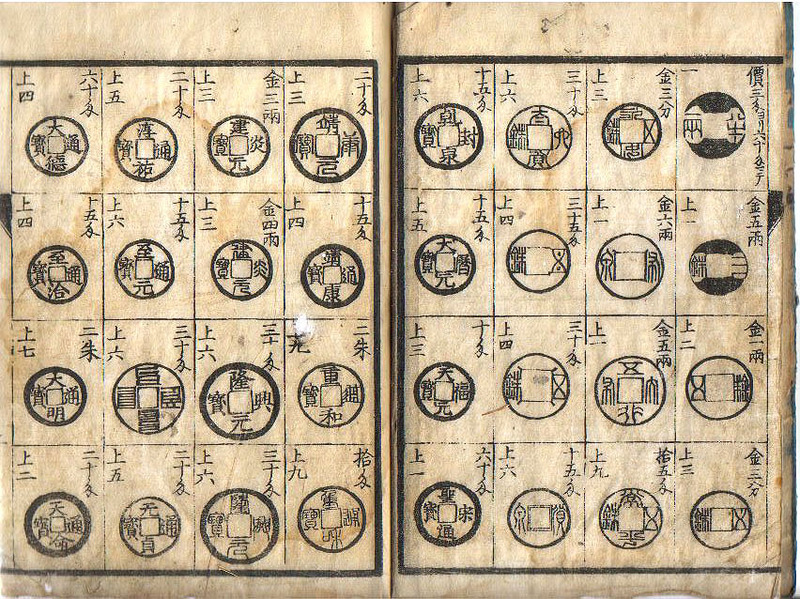 The coins are all from China and arranged in rough chronological order moving in columns right to left from ancient up to the Ming dynasty. However, many coins which could fit this progression are not used on this page and presented in later pages, so it is of course very incomplete. Prices are given in both silver monme units and in gold units of shuu and ryou. The first coin, and Ban Liang was very rare back then. The author gives it a rarity of 1 and a value "ranging from 3 to 60 monme." Exchange rates between the three currencies of gold, silver and copper fluctuated, but roughly, one monme was worth about 100 mon of copper coins and 5 monme was worth about one shuu of gold. The Ban Liang is very common among collectors today. Most Chinese coins that circulated as currency in Japan were one mon (one wen) coins from the Tang dynasty through the Ming dynasty. Pre-Tang and higher denomenation coins have steadily decreased in value since the 1870's. In the 1990's the prices of most of these coins fell very steeply because so many are being excavated in China these days and exported, due to its rapid economic growth.